Go to the Hege Library databases page. Click on the History link or go to the A-Z Tab. You must be on campus or in the library to view the actual record pages. If you log in to your Guilford account from off-campus, you may be able to search for records and see summaries, but not the scanned image. 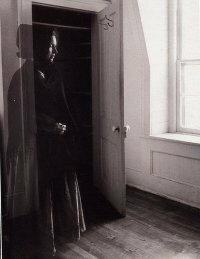 Four major repositories of American Quaker records - Earlham, Guilford, Haverford and Swarthmore colleges - made an agreement with Ancestry.com to make the records more accessible for genealogy. In 2012, the colleges provided Ancestry with access to their meeting minutes and vital records that were more than 75 years old. In return, Ancestry provided many work hours to scan and index them - almost two years of work. In the Search drop-down menu, select Card Catalog. In the Keyword box, type "Quaker" and hit Search. Select U.S., Quaker Meeting Records 1681-1994. Now you can search on your Quaker ancestor. 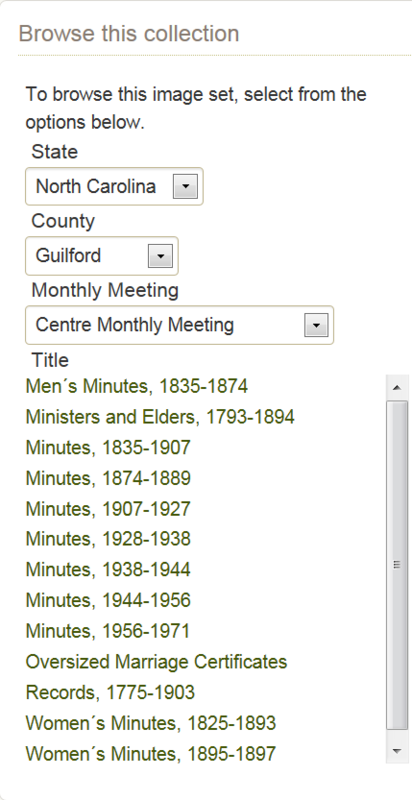 Or, if you'd like to browse a particular meeting, select the State and County on the right side of the page. such as the Women's Minutes 1825-1893. You can see the book's pages in the viewer. Use the arrows at the bottom of the screen to turn pages. To skip to a certain page, click in the page number box and type a number. Note that the screen page number may be different from the record's page number. To quickly see which names are on the current page(s), click the green Index box in the lower left corner. Keep a research log - write down what you were searching for, what you found, and the date that you printed or saved the file. When you save a document, name the file in a way that will help you find it later, such as “Mary Jones marriage” or “Springfield MM 1861.” Right-click the orange Save button, then select “Save as…” Browse to the correct folder on your computer and name the file. On a Mac, use command (the apple)-click as a right-click. To save ink, first save the document as an image file. Open the file, crop off the black border, and then print.